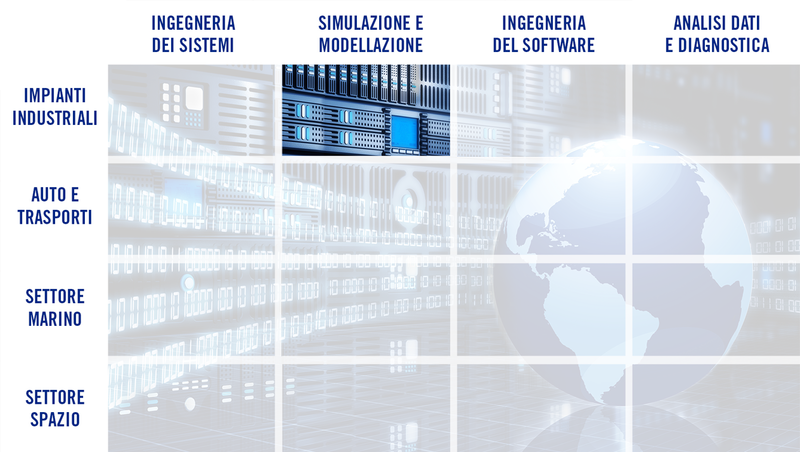 I servizi di simulazione e modellazione nel settore degli impianti industriali riguardano la simulazione dinamica dei processi e del funzionamento e controllo delle macchine, necessari per verificarne la progettazione, tramite l’utilizzo di prodotti software avanzati proprietari (come ad esempio ACUSCOMP, ACUSYS, COMPSYS, MECHDYN). Normalmente, l’attività di simulazione e modellazione consiste nella consulenza a clienti di grande dimensione aziendale, quali compagnie petrolifere, società di engineering e contracting di grandi impianti, e costruttori di macchine di elevata potenza per la generazione di energia (turbine), il processo di gas (compressori) o il pompaggio di liquidi (pompe). Si tratta a volte di lavori di durata poliennale, come ad esempio nel caso dell’importante e articolata attività di simulazione per un impianto di liquefazione di gas naturale (LNG) di una nota compagnia petrolifera norvegese. 123C - Simulation service by ACUSYS & ACUSCOMP, according to API 618 standards (approach 3) of a compressor for transport and disposal of CO2 in oil and gas plant - 2014, Jul.-Sep.
122C - Analysis and solution definition of pressure shocks in TAR gasifier, due to waste liquid pumping and injection system - 2014, Jun.-Sep.
121C - Simulation service by ACUSYS & ACUSCOMP, according to API 618 standards (approach 3) of the pressure pulsation of associated gas compressor in an onshore gas development plant - 2014, Mar.-Apr. 120C - Design of pressure pulsation dampeners for reciprocating compressors of natural gas and verification vs. API 618 standards (fuel and sale gas compressors) - 2014, Jan.-Mar. 114C - Advanced course and consultancy on dynamic simulation of pressure pulsation in compression systems with reference to API 618 standards (approaches 2& 3) - 2013, Jul.-Sep.
111C - Pulsation analysis by ACUSCOMP & ACUSYS, according to API 618 standards (approach 2), of a recip. compression station for underground natural gas storage. As built analysis - 2012, Jul. 109C - Simulation service by ACUSYS & ACUSCOMP, according to API 618 standards (approach 3) of the pressure pulsation of one process reciprocating compressor skid - 2012, May-Sep.
108C - Acoustic pulsation analysis by ACUSYS of the glycol pumping system for a gas processing unit - 2012, Mar.-Apr. 107C - Dynamic simulation study of a subsea wet compression unit. Phase 1 - 2011, Dec.-2012, Jun. 103C - Acoustic analysis by ACUSYS of flow induced vibrations due to "riser singing" in a Floating LNG storage and regassification unit - 2011, Sep.-2012, Jan.
102C - Acoustic analysis by ACUSYS of the Xylene splitter bottom pumps in a refinery - xylene fractionation unit - 2011, Aug.-Sep.
98C - Dynamic simulation of the BREATHING air systemfor the evacuation system in an offshore oil production field - 2011, Mar-Apr. 93C - Preliminary study of a hyperbaric separator for subsea oil spill containment - 2010, Aug.
87C - Simulation service by ACUSYS of the wash water pumping system for a refinery reduced crude desulfurization unit. Recycle line adjustment. - 2010, Feb., on hold then restarted after Jul. 2012. 86C - Acoustic pulsations verification and remedial design to flow induced vibration in a large steam generator burner and exhaust duct - 2009, Sep.-Oct.
83C - Simulation service by ACUSYS of the wash water pumping system for a refinery reduced crude desulfurization unit. Shaking forces - 2009, Sep.-Dec.
80C - Advanced course on dynamic simulation of pressure pulsation in compression systems by ACUSYS & ACUSCOMP - 2008, Nov.
78C - Simulation service by ACUSYS of the wash water pumping system for a refinery unicracking process unit, fractionation section - 2008, Oct.-2009. Aug.
74C - Simulation service by COMPSYS for the analysis with modified antisurge control of the subcooling compressor system of a LNG production plant - 2008, May-Aug.
70C - Study and fluid dynamic optimization of an energy recovery system by hydraulic turbine for a centrifugal decanter - 2008, Jan.-Mar. 56C - Simulation service by ACUSYS of the IGCC plant. Design of pulsation dampeners and pulsation analysis of the TAR pumping system feeding the gasifiers - 2004, Oct.-2005, Feb.
51C - Simulation service by COMPSYS for the analysis of antisurge and transient behaviour of a Gas Compressor Station - 2003, Sep-Dec.
50C - Simulation service by COMPSYS for the analysis of antisurge and transient behaviour of a large Gas Compressor Station - 2003, May-2004, Mar. 46C - Simulation service by COMPSYS for the analysis of antisurge and transient behaviour of the compression systems of a LNG production plant– Phases 1,2,3 - 2002, Dec.-2003, Dec.
44C - Simulation service by ACUSYS of the IGCC plant. Pulsation analysis of the TAR pumping system feeding the gasifiers. Phases 1,2,3 - 2002, Nov.-2003, Jun. 43C - Simulation service by COMPSYS for the analysis of antisurge and transient behaviour of a sales gas compression unit - 2002, Oct.-2003, Jan.
36C - Pulsation study by ACUSYS of a propane refrigeration plant, with screw compressor for a refinery plant - 2001, Dec.
34C - Simulation service by COMPSYS for the analysis of antisurge and transient behaviour of a sales gas compression units. Phase 1 - Single train cases - 2001, Sep.-Dec.
33C - Pulsation study by ACUSYS of the Transmediterrean gas pipeline compression stations generated by vortex shedding effects and compressors vanes - 2001, Aug.-Nov.
31C - Pulsation study by ACUSYS of the Transaustria gas leitung compression stations generated by vortex shedding effects and compressors vanes - 2001, May-Oct.
30C - Simulation service by COMPSYS for the analysis of antisurge and transient behaviour of an offshore gas lift and injection compression units. Phase 2 “as tested” cases - 2001, Mar.-Aug.
26C - Advanced course on dynamic simulation of pressure pulsation in compression systems by ACUSYS - 2000, Jul. 23C - Consultancy and simulation of an organic waste processing and pumping system by ACUSYS - 2000, Jan.
22C - Advanced course on dynamic simulation of pressure pulsation in compression systems by ACUSYS - 1999, Nov.
16C - Simulation service by ACUSYS for the analysis of pressure pulsations for the reservoir pumping system of avacuum residue upgrading plant - 1998, Jun.-Jul. 15C - Course on dynamic simulation of pressure pulsation in compression systems by ACUSYS - 1998, Mar. 10C - Study of dynamic pressure pulsations instabilities in combustion chambers, with a modified version of ACUSYS - 1995, Jul.-Oct.
9C - Consultation on methods for the design and optimisation of hydrocarbons production separators - 1994, Sep.
2C - Development of a computer model and analysis by simulation of the flow characteristics through an innovative, passive flow control device for oil/gas separators - 1992, Feb.-Apr. 1C - Analysis by computer model simulation of process flow characteristics and control system behaviour of a subsea multiphase flow metering system - 1992, Sep.-Dec.